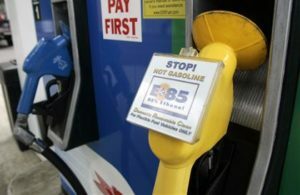 In response to skyrocketing oil price at the global market, the Ethiopian government on Friday unveiled that it will increases the volume of Ethanol content in gasoline to 10% as of March 15. Since 2009, the country has been provided a 5% ethanol and 95% benzene blended (technically known as E5) for the market in which a Sudanese owned oil company, Nile Petrol, was a sole agent that was carrying out the blending process and distributing for all local oil station. But now the Ministry of Water and Energy (MoWE) declared that Oil Libya is awarded the task of blending the 10% ethanol-Benzene blend. According to the Ministry of Water and Energy, the country has a plan to top up an ethanol blended oil to the local market to reach E25 (a 25% ethanol content blended in Benzene and biodiesel). The State Minister of MoWE, Wondimu Tekle, said that the consumption of oil that is imported to the country is increasing with the booming of economy in the country. According to him, Ethiopia spends more than 8.6 billion Birr every year to import fuel oil with hard currency. “We want to increase the ethanol content from E5 to E10 to help lower the foreign exchange we spend on oil. This is also important measurement to stabilize the market by reducing the burden of the entire consumers,” he said. “Since we import oil with huge amount of hard currency, the only solution we have is to develop alternative energy sources like bio-fuel,” he added. He pointed that due to the introduction of this project, mostly in Addis Ababa and its surrounding areas, the country was able to blend over 13 million liters of ethanol blended oil (E5) and as a result saved over USD10 million in two years. According to a document obtained from MoWE, from 2009 to the end of 2010, about 2.9 million liters of ethanol has been so far blended with over 245 million liter of Benzene. In his briefing, the state minister confirmed that, while designing this massive plan of developing bio-fuels projects, the government had hoped that private investors would contribute a lot; however, most of them failed to so. He also explained that his office has identified those investors and sent their name to the Ethiopian Investment Agency and other pertinent government organizations to take action against these companies who didn’t live up with their commitment. But the state Minister declined to mention the names of those companies. Ethiopia has three state owned sugar factories which have been operational for long time, including Fincha, Metahara and Wonji. However, the country produces ethanol from byproduct of sugar factory solely from Fincha which has been so far producing Eight million liters every year since 2009. Similarly, Metahara Sugar Factory is currently set to start producing Ethanol that amounts to 10 million liters per year as of this month. The fourth factory which is under construction is the Tendaho Sugar Factory which was also said to be the biggest and most promising factory expected to produce huge amount of ethanol upon its completion. According to the state minister, upon the completion of all sugar factories including the private factories, the country will be able to produce over 180 liters of ethanol after five years. Of course, Ethiopia has been producing ethanol only for benzene consuming automobiles. But the state minister indicated that still another project is on the pipeline to produce biodiesel for diesel consuming motors. According to MoWE, the bio-fuel is set to be produced from jatropha, caster seeds and palm trees in which the planting of these trees is being undertaken by the Ministry of Agriculture and Regional Development in Amhara, Tigray and Southern regions. Nadew Tadele, Director of Bio-fuel Development Coordination Directorate within MoWE told Ezega.com thatthe Organization of the Amhara Rehabilitation and Development Association (OARDA) is the first local company that will build biodiesel processing factory in Bati Woreda of Amhara Regional state. The organization is also seeking the technological assistance from the MoWE. However, Nadew did not indicate the investment amount the organization has proposed. OARDA has so far planted over 165 million seedlings of Jatropha in 50 woredas in degraded areas as part of preparation for the would be built biodiesel processing factory, according to Nadew. Does this article really mean bioethanol and benzene (C6H6)? Or does benzene mean something else in other countries?